Computer Server Rack Facts, Questions and Answers. In any data center, aisle arrangement is an important necessity to assist with data center cooling and air flow. 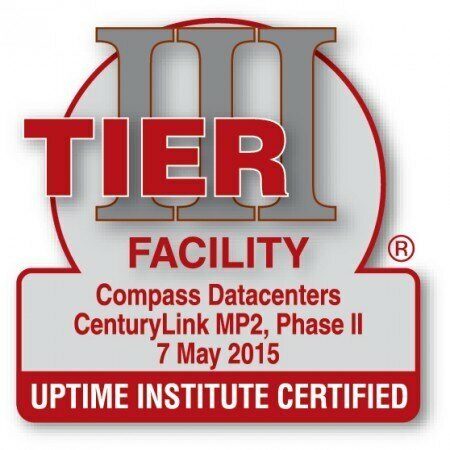 “There are many factors that go into the design of data center space,” says Data Center professional, Vincent Fava. “Aisle pitch is one of the most important things to consider.” Aisle pitch is defined as the measurement of row-to-row spacing between the center of adjacent cold aisles. It is best practice for the front of each rack to face each other on cold aisles with racks facing back to back on the hot aisles. Aisle pitch is important because the density of racks on the floor ties directly into density of power and thermal management of space. 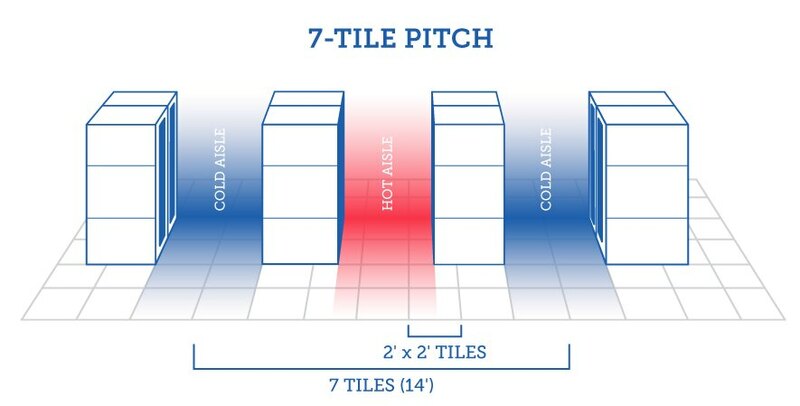 The most common set up in data centers is the 7-tile pitch rule, which is 14 feet in overall width, assuming the data center using 2 x 2 foot (0.61 x 0.61 m) tiles Each cold aisle width should be 2 tiles which is equal to 4 feet and each hot aisle should be 3 feet wide. It’s important the front facing edge of the rack matches the edge of the floor panels facing the front of the opposite rack with 1 mm of front clearance, and .6 mm rear clearance. A standard 42-inch-deep rack will cover 1 and a half tiles. While the 7 -tile pitch rule is the most used, other things must be taken into consideration. For example, a higher capacity data center might use a 6-foot cold aisle, and a telecommunication might use a much narrower pitch. The method used is dependent on customer and facility requirements. A data center engineer should determine if things like Power Usage Effectiveness or how “green” the data center is should drive the design of the facility. Probably one of the biggest factors is if the data center is starting in a predefined space or building from the ground up. A data center in an already existing building must consider the floor space it currently has available, wherein if they are starting from scratch, they can have more flexibility and build to their needs. IT professionals in Data Centers are looking for more tool-less options for speeding up the mounting process. Button mounts have become more and more common on server racks by several well-known manufacturers. 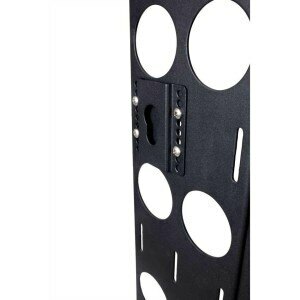 Button mounts serve as a tool-less method for vertically mounting longer equipment to the side of a server rack. The “button” is usually located on the back of vertically mounted equipment. Button mounting points are most commonly found along the side of the uprights of the rack. Button mounts are often used as a tool-less method for mounting Power Distribution Units (PDUs) and vertical cable management solutions. The increased demand for tool-less mounting has caused many companies to create adapter brackets for button mounted equipment. RackSolutions has recently created a button mount adapter for their Rack 111 Open Frame Rack, which mounts directly to its cable management bars. The Open Compute Project revolves around the Open Rack, a 539mm (21.22”) wide equipment space with a 48mm (1.89”) OpenU tall space. The power for the rack is standardized on a 12 VDC bus bar that runs the entire height of the rack. The benefits from this are a wider and taller space for the servers promote easier air flow through the equipment. Since power distribution and conversion is centralized to “Power Shelves”, this reduces the amount of intermediate power conversions along the way increasing the overall efficiency of a data center. 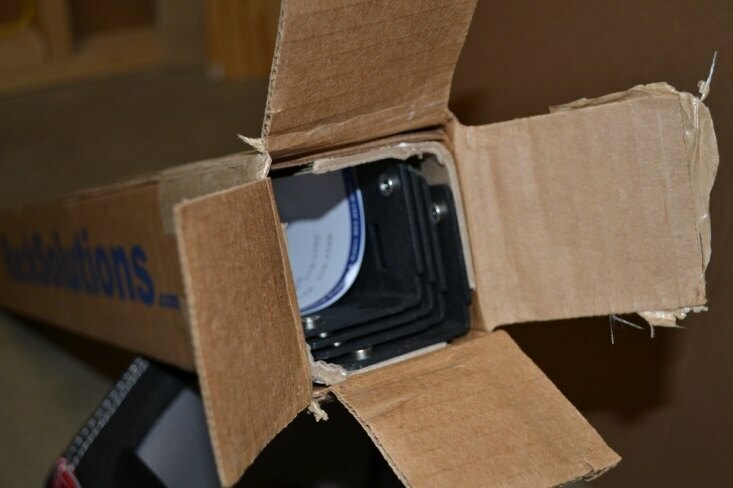 This saves money money two-fold, by having more efficient cooling and by having less heat to remove. One of the signature things about OCP is called vanity free, if it doesn’t provide compute power or storage, you don’t need it. This philosophy keeps the equipment minimalist, utilitarian and ultimately lower cost than the more known OEM solutions. Bezels and pretty faceplates are out, efficiency is in. The v1.1 and v1.2 standards are lot more specific in relation to the mounting holes and mounting hole spacing when compared to v1.0. This makes it easier to interchange rails and accessories between different rack manufacturers. I have wanted to install network wiring throughout the house. 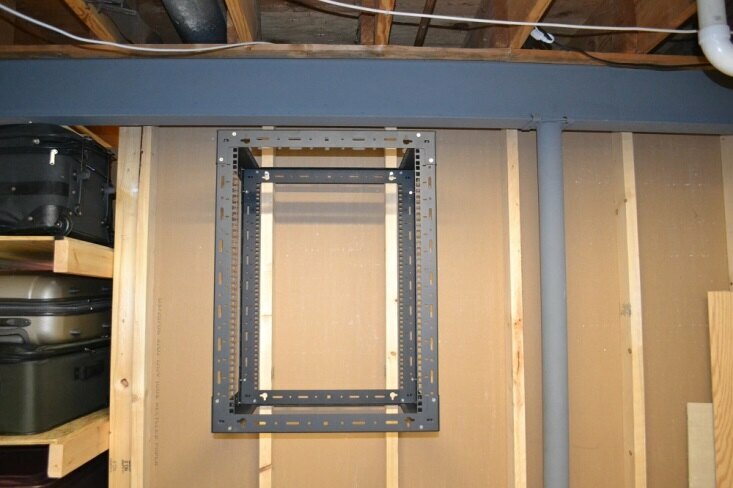 A co-worker recommended an open frame wall mount rack for keeping equipment elevated, organized, and out-of-the-way. I was directed toward a few networking equipment websites, including RackSolutions.com. 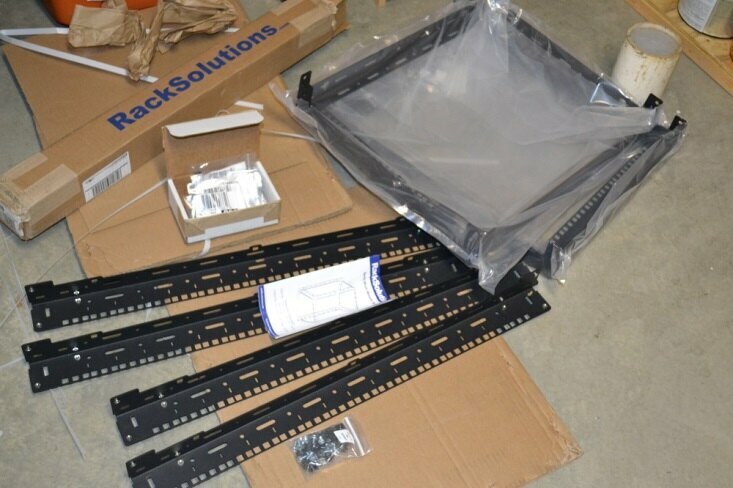 The level of customization that RackSolutions.com has on their open frame wall mount racks was instantly appealing. I settled on a size of 15U tall and 9U deep. The metal is solid, and has a very durable paint coating across every surface edge. Running your finger over the metal, especially near corners or punched/cut areas, revealed no sharp or jagged edges. Each post had several threaded connections installed, which would be used to attach the post to the rack’s top and bottom sections. 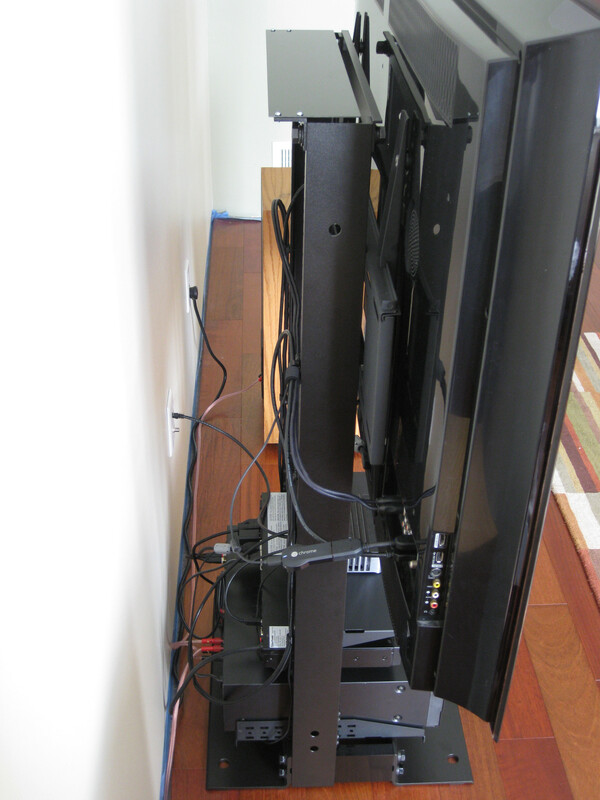 The assembly couldn’t have been easier – only a single, #2 Phillips screwdriver is needed. The posts are designed in a way that only allows it to fit a specific alignment with the top and bottom of the rack. This is accomplished through some notches placed at the ends of the posts. Each post fits within the inner-corner of the top and bottom of the rack. After marking and pre-drilling two holes for the top of the rack, two lag bolts and washers were installed. About one-half inch of space was left between the bolt heads and the studs. 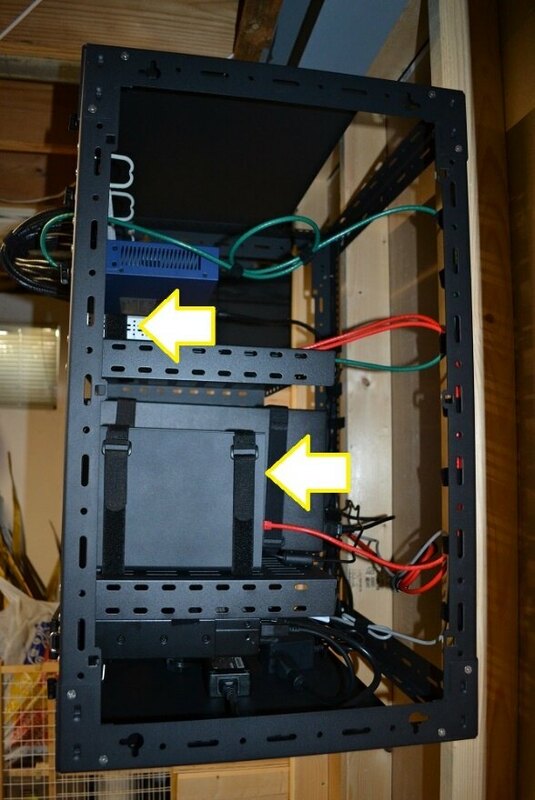 I first installed the patch panel, network switch, and a two-post shelf into the rack. To keep the free-standing components in place and remove any risk of tipping or falling, I ran Velcro cinch straps around the devices. This product is simply outstanding, and I am absolutely thrilled with how this project turned out. Once the wiring has been installed into the walls, I am completely confident with housing my network and household components in this rack. 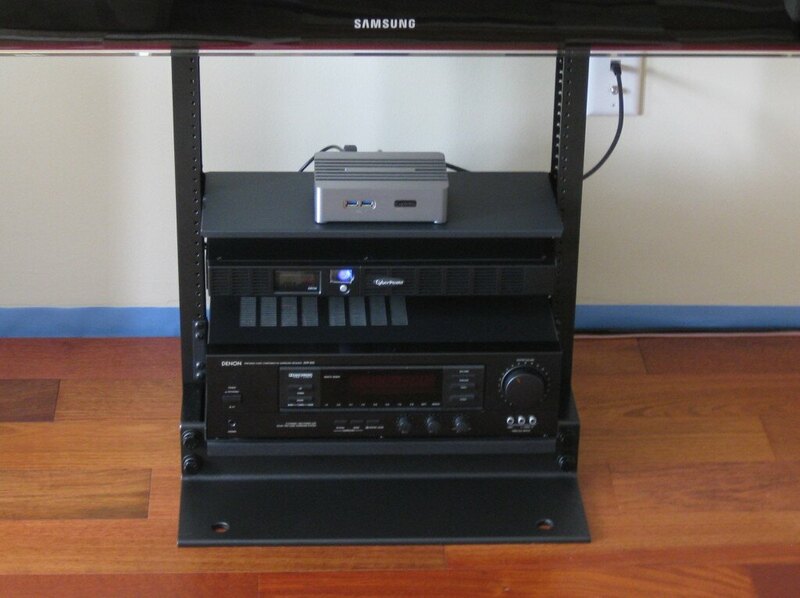 The rack is quite sturdy and well-built, and I have no doubt about its durability for years to come. 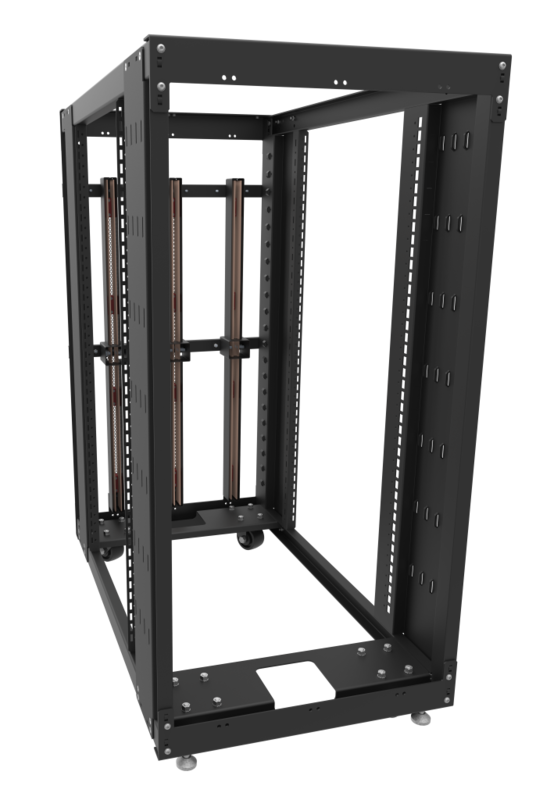 RackSolutions offers plenty of accessories for customizing the look of the rack, which allowed me to select a combination that fit my current needs and plans for the future. There are many ways to utilize 2 post racks. 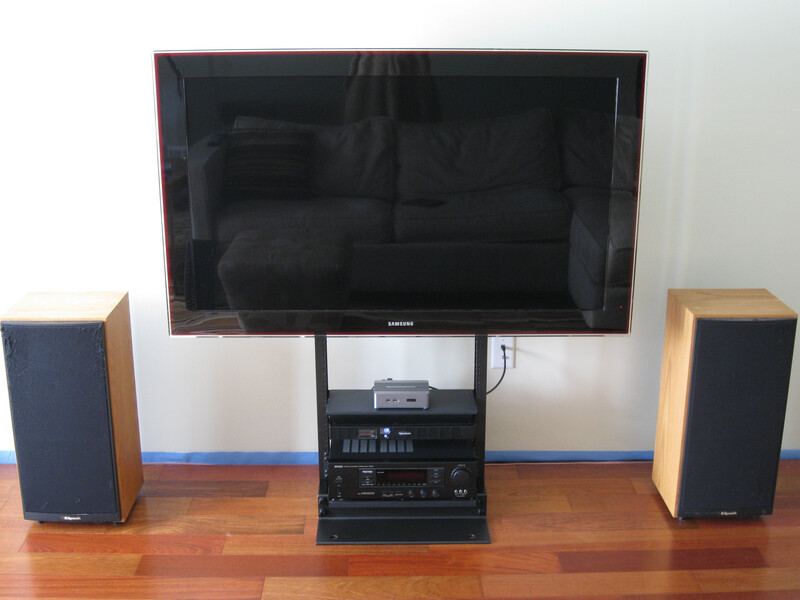 This customer demonstrates that it can even be used as a TV stand. Question 1: What is a “U space”? 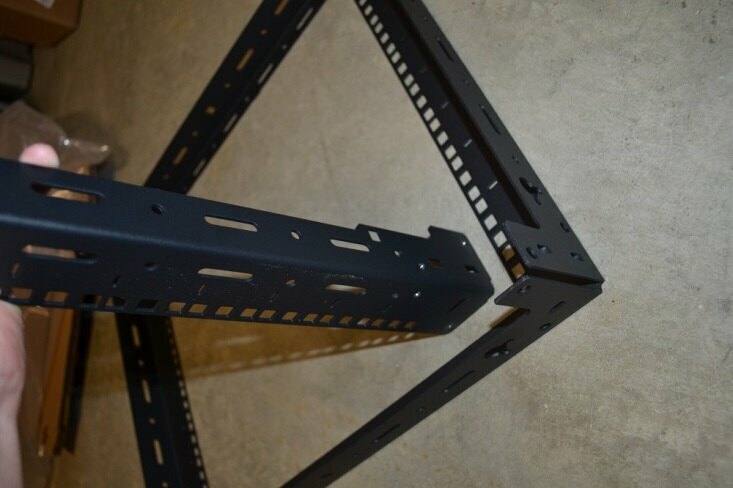 A “U” or “RU” is a unit of measurement that is commonly referred to when discussing rack-mounting equipment. A “U space” is 1.75 inches and is commonly 3 hole spaces tall. Question 2: What is the most commonly used rack? 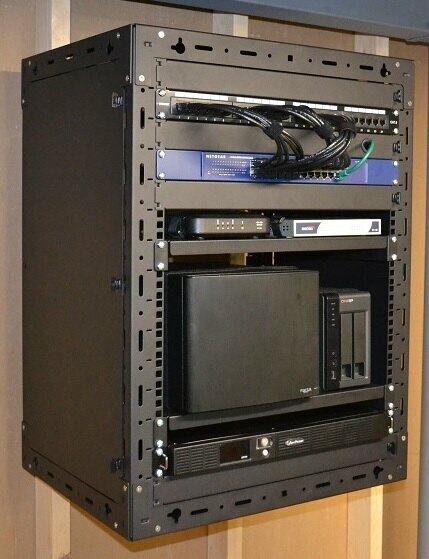 We find that most Rack Solutions customers typically have a 4-post square hole rack. It’s called a “4-post rack” because there are 4 uprights and as you can see the holes of the rack are square. Question 3: What is a 19 inch rack? A 19 inch rack is the standard EIA-310 server rack. The term “19 inch rack” comes from the width of the equipment in the rack. If you have any technical questions like the ones I have answered today please let us know. You can call send us an email or use technical support chat at racksolutions.com. 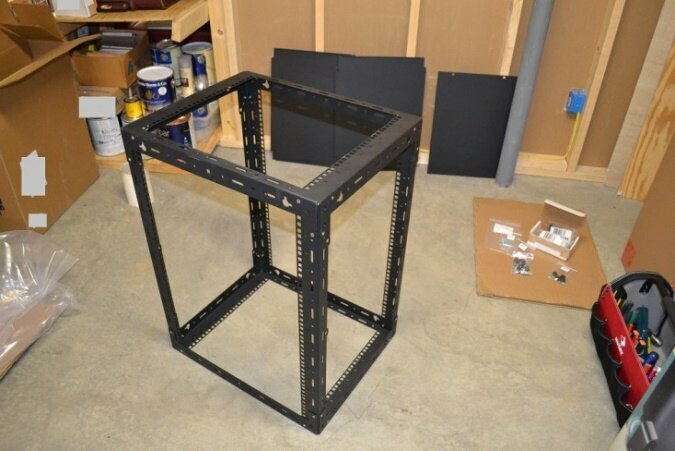 Every rack manufacturer has different features for their server racks. 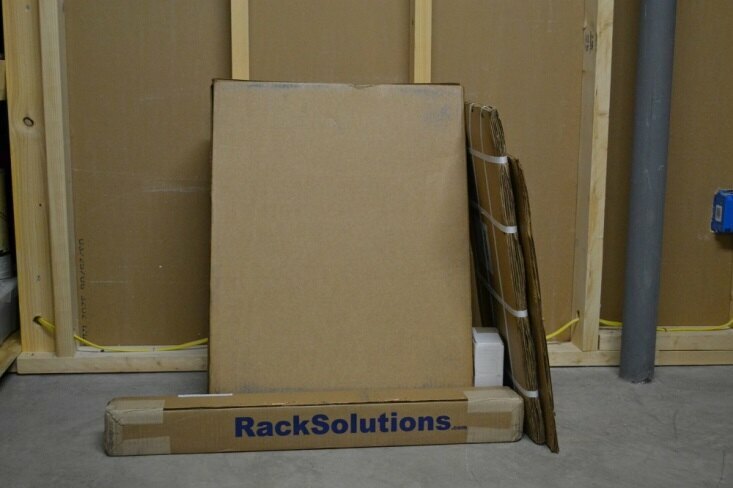 The rack shown in this video can be found at RackSolutions. 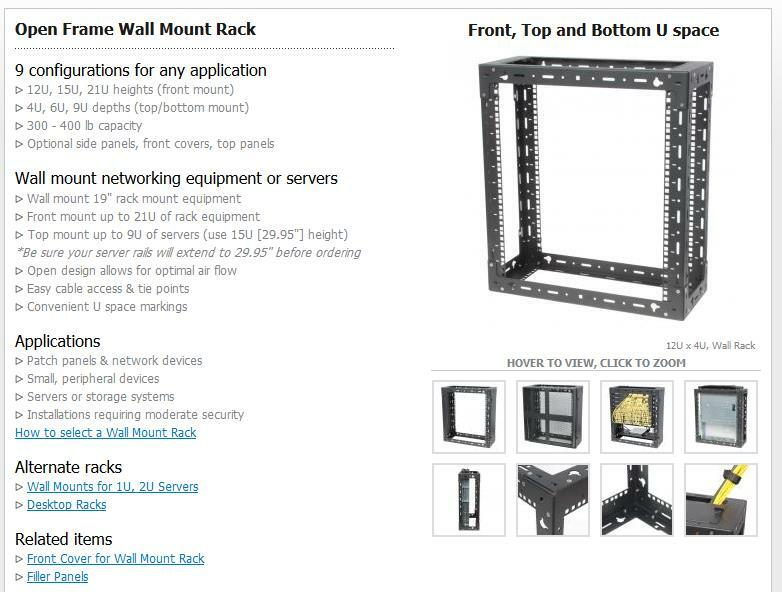 The rack shown in this video can be found at RackSolutions.